Place peanuts on a baking tray. Bake in 350°F (180°C) oven for 15 minutes or until golden brown. Remove and allow peanuts to cool. Place cooled peanuts in a food processor. Press the pulse button to coarsely chop peanuts. Do not over grind. Sift all-purpose flour, rice flour, and baking powder into a large bowl. Add salt. Combine egg, coconut milk, and water in a small bowl. Pour onto sifted flours and mix well. Cover with plastic wrap and allow it to rest for 30 minutes. Melt one teaspoon of butter in an 8-inch non-stick fry pan on medium heat. Swirl melted butter around the pan. Mop up any excess with paper towel. Pour about 1/3 cup batter into pan. Swirl pan so that batter covers the base and slightly up the sides of the pan. When batter starts to bubble, sprinkle two teaspoons of sugar followed by two tablespoons each of peanuts, cream style corn, and grated coconut evenly onto batter. Dot with a teaspoon of butter and allow pancake to cook for 3 to 4 minutes until golden brown. 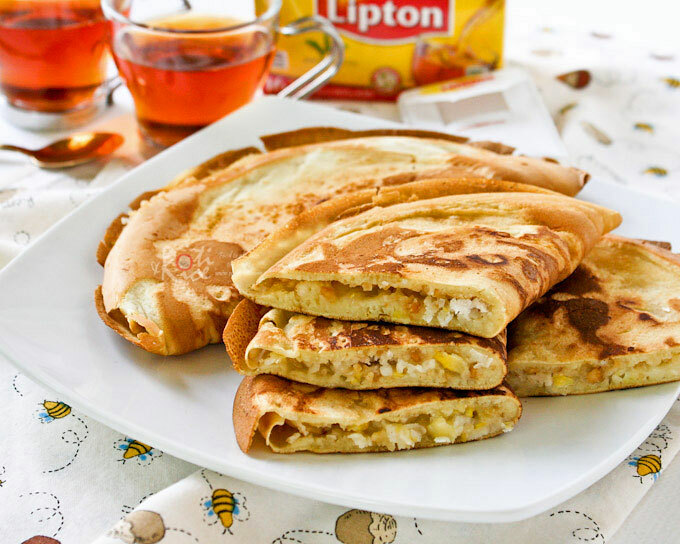 Using spatula, fold pancake in half. Remove.